A while back, I posted about a kale recipe that I cannot get enough of. Well, here is a great way to incorporate it into an amazing recipe that is loaded with flavor. This recipe takes some time, but is worth it and you should have leftovers. We enjoyed it on New Years, as a good luck dish (legumes & greens = CASH MONEY). I also served it at my December pop-up dinner and it was a huge hit with everyone. Worth it! Yet another win for vegan deliciousness! Enjoy. In a large pot or crockpot, cook the beans over low heat in ample amounts of water with the two bay leaves until quite soft, approximately 2-3 hours. Roast the tomatoes. Preheat the oven to 350F. Line a baking sheet with parchment paper, arrange the tomatoes in one layer, drizzle with olive oil and sprinkle with salt & black pepper. 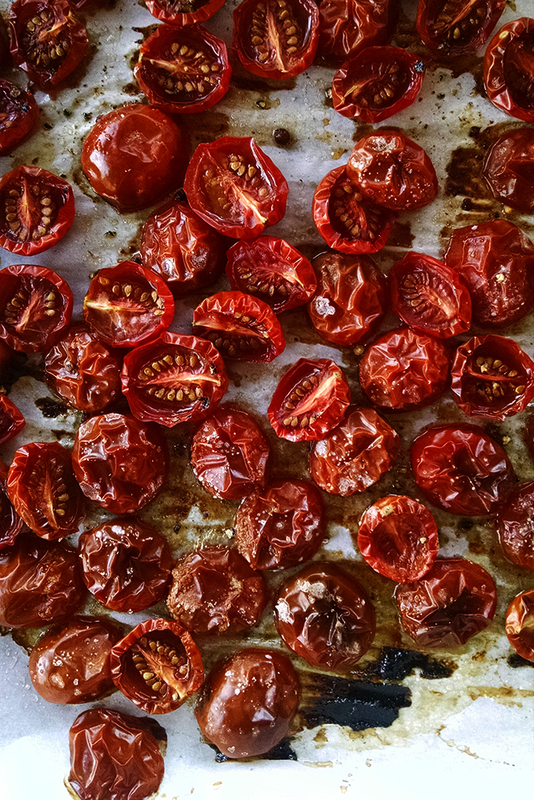 Roast for about one hour, until the tomatoes are shriveled and reduced in size. This technique is great for bringing out natural sweetness and flavor in even a mediocre tomato. When done, remove from oven and set aside.. Using a knife, slice the stems from the kale and set aside the leaves. Slice up the stems into small pieces. In a heavy bottomed skillet, saute the onions over low heat in the olive oil until they begin to soften, about 10 minutes. Add the garlic and kale stems and continue to cook until all is soft and caramelized. Slice the grilled kale leaves. It is now time to assemble the beans. Strain the beans and discard the water, or save to make aquafaba. In a heavy bottomed skillet, combine the beans, kale, caramelized onion, garlic and kale stems. Stir to combine and warm over medium to low heat. Add lemon zest & juice. Taste and adjust salt. Add cayenne pepper if you like spicy. Add the tomatoes and gently stir in. This should be bursting with umami and flavor. Enjoy with bread, rice, in a tortilla or all on its own.